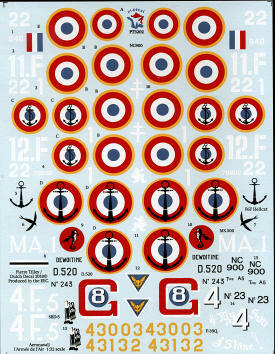 For their second sheet, PT Decal has decided to do a bunch of various types from both the French Air Force and the French Navy. This sheet covers no fewer than eight schemes on six different airframes. Fortunately for us all, there are kits in 1/32 to cover these various markings, though some may require a bit of searching to locate. The sheet includes plenty of cockades, though the builder will need to paint any rudder stripes needed. First up (and this is by the order shown inside the instructions), we have a pair of P-39Q aircraft Both are from GC 1/9 Limousine and in Olive Drab over Neutral Grey. 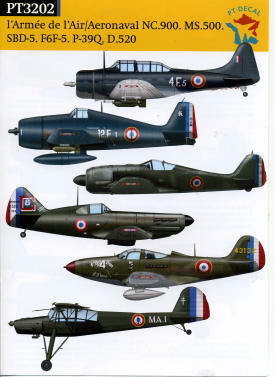 These planes were usually well used and based in Algeria during 1945. Next a MS.500 (Fieseler Storch) from Mobile Base Indochina in 1949. The scheme is overall RLM 70 or 71. A pair of Hellcats is next, both F6F-5 versions and both in overall Gloss Sea Blue. They were assigned to 11F and 12F at Hanoi in 1954. Due to the climate, these would have been rather weathered. The fourth aircraft type is an SBD-5 from 4F aboard the Dixmunde in 1947 when deployed into waters around Indochina. This aircraft is in the tricolor scheme. There is a SNCAC NC.900 (FW-190A-5) based with GC III/5 Normandie-Niemen at Toussus-le-Noble in 1946. Overall RLM 70 or 71. Finally, a D.520 based in France during the summer of 1945. Obviously a personal aircraft as there is no unit listed. Again, overall RLM 70 or 71. The decals themselves are superbly printed and should work well with any setting solution. A great set for those looking to model something a bit different from the norm. As with all these sheets, they come with a full color markings guide that includes a photo or two.